To preserve this freedom, we must continue to hold before the American people the spiritual foundations of our Country. We must reaffirm our faith in Almighty God and constantly rekindle that spirit of humble reliance on Devine Guidance which inspired the founders of our Country and it behooves us as a Nation to arm our people in times of peril with the ageless weapons of moral and spiritual might and to uphold and preserve, unimpaired the spiritual heritage of America. Therefore, as Chaplains of The American Legion Department of Ohio, it is our mission to at all times, strive to remind all Americans that God is the source of all rights and privileges. Awarding the performance of an outstanding Post Chaplain. Learn more about serving as a Post Chaplain. 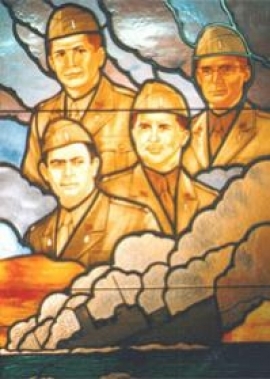 Inspired by the heroic deed of four Chaplains during World War II, The American Legion each year marks the anniversary of their supreme sacrifice through special services and programs throughout the nation. This annual observance, as a part of the Legion’s “SERVICE TO GOD AND COUNTRY” program, helps bring new emphasis to the religious aspects of our American heritage and the need for continuing adherence to the basic religious concepts upon which America was founded.